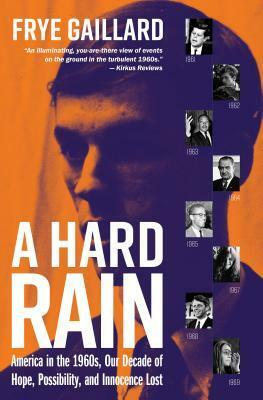 A HARD RAIN is a large book - over 700 pages - divided up by years in the 60s and the significant events of each year. 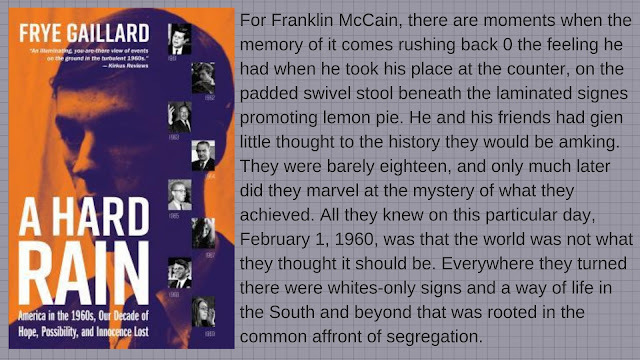 It combines politics, the assassinations of JFK, RFK and MLK, the Vietnam protests, the civil rights movement, the women's movement and so much more. Plus it recognizes the strong role that music played in this decade - Joan Baez, Bob Dylan, Motown just to name a few. Reading this book brought back so many memories to me - both happy and sad. This is a book that will stay on my bookshelves as a reference to dig down deeper into some of my fading memories. Frye Gaillard is an award-winning journalist with over 20 published works on Southern history and culture, including Watermelon Wine; Cradle of Freedom: Alabama and the Movement that Changed America; The Books That Mattered: A Reader's Memoir; Journey to the Wilderness: War, Memory, and a Southern Family's Civil War Letters; and, most recently, Go South to Freedom. Writer-in-residence at the University of South Alabama, he is also John Egerton Scholar in Residence at the Southern Foodways Alliance at the University of Mississippi. He is the winner of the Clarence Cason Award for Nonfiction Writing, the Lillian Smith Book Award, and the Eugene Current-Garcia Award For Distinction in Literary Scholarship. I really liked that book! I am a nut for the Beatles. Though I was young in the 1960s I still marvel at the whole decade. I've always been interested in reading about the 1960's. I was very young in the 60's and don't remember much. Have a great weekend! I do enjoy books about social history and even though I don't generally read non-fiction from cover to cover, this kind of reference material which you can dip in and out of, works for me - even if this particular collection is US centric. I was born in 1958, so although I remember the 1960s, it would only have been the very latter part of the decade which would have influenced ny life in any way.